A super brilliant 15-year-old boy, Okorogheye Orisheneye David, has impressed everyone with his excellent performance in WAEC and JAMB. He got straight A1 in all the nine courses he registered for WAEC 2018. 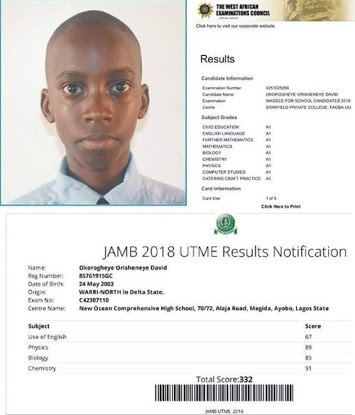 He also did very well in JAMB, with a score of 332. Kudos, boy!